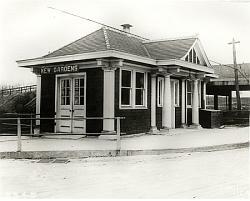 If you lived in Kew Gardens before the mid-1970's, you'll recognize the building in the black and white photograph as the old Long Island Railroad waiting room on the Jamaica bound platform. That's the Lefferts Boulevard overpass in the background before construction of the stores. This vintage picture postcard shows where the waiting room was located in relation to the main station house. In the 1970's, the waiting room became a target for vandals. It was closed and eventually torn down. "Some interesting facts about the eastbound Long Island Railroad station house featured in this month's slide show. While it was principally built as a waiting room, it was never intended for commuters but was designed to accommodate vacationers heading for the east end (the Hamptons and Montauk). The double doors on the platform side allowed a baggage clerk to wheel luggage in and out. I am uncertain as to whether tickets were ever vended inside but the right one third of the structure (looking at it from the main entry) was divided off as an office and eventually became the home of the Kew Gardens Auto Rental (a local limousine company). The building was heated by a real old fashioned potbellied stove the fuel for which being supplied by the railroad and delivered to a bunker behind the office. Starting the furnace was no automatic operation and the first task each winter morning was to load coal and light the fire (this chore was left to the drivers). In later years, and after the taxi business shut down, the building began to deteriorate and became both a hangout for local hooligans and a late night lover's lane. 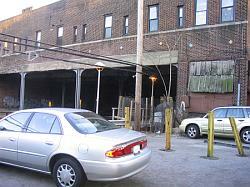 The rest, of course, is history and is depicted in the second slide show picture showing what is now a vacant lot." Thanks to Michael Jovishoff for the 2004 photograph. This site is a trip down memory lane. The pictures are wonderful. although we moved last year to NJ I often visit mom on 124th street. The neighborhood has changed dramatically. I trull miss Frank the GoodHumor man and Bernie & Claire of Bernie Land. I was born at 8333 Talbot St., and lived there until we moved to Forest Hills in l94l. I took the Queens Blvd. bus to school every day so that I could graduate with my class. Then we mostly all went off to the newly built Forest Hills High School. I still live on Long Island, in Rockville Centre. I also remember this accident cause the back of our house was at Cuthbert and 124th place. We watched from my bedroom window as they took the injured into the houses at the corner of 124th and all the ambulances came. They ripped the fences down and forced the people to accept the injured into their homes. It was a very loud crash and lots of crying people. We had a house full of company and we all watched it all. I have never seen so many people in one place except for times square at new years eve. Cannot remember the exact age I was but It will be forever engraved in my mind. As I reread Alan's email, it was my 8th birthday party we were celebrating. We always did it near Thanksgiving so that all the family could come. In regard to the Long Island Railroad crash that occurred on November 22nd. 1950; I was home on 83rd. Avenue with my younger brother and did hear what sounded like a thud sometime during the evening. My parents were at the Richmond Hill Jewish Center where my father was giving a song recital. Upon hearing the news my father, who was a practicing surgeon, immediately left for Jamaica Hospital where most of the injured were being taken for treatment. There is contention as to where the crash occurred with some reports saying Kew Gardens and others indicating Richmond Hill. Both may be correct! While it would be impossible to pinpoint the exact location of impact (due to the kinetic energy that pushed the entire mass of the two trains forward) wreckage and derailed cars spanned a distance of about one fifth of a mile encompassing both villages. The next morning we walked down to the end of Cuthbert Rd. at 124th. Place and could see the rear most cars of the colliding train being lifted back onto the tracks by railroad cranes. I cannot assess where blame for the tragedy should have been placed, but I can tell you that as a result of this accident all Long Island Railroad passenger cars assigned to the rear of any train were equipped with special bright red and white electric lights. Saw your plea for information on the family of Art Leonard who was both a film producer and proprietor of 'Art Leonard's Rainbow Inn' on 83rd. off Lefferts in the early fifties. While I have no knowledge as to where his relatives might be, I can tell you that if you do find them you may also find a copy of a documentary film he did on Kew Gardens. I remember it well because I appeared in a scene (as an extra) on the Long Island Railroad eastbound platform supposedly boarding a train for Jamaica. It must have been in the dead of winter because I also remember wearing a fur lined cap with muffs over my ears. I am uncertain as to how far and wide the picture was distributed, but it was certainly shown at the Austin where I viewed it a number of times. Editor's Note: Can anyone explain the outfits worn by the boys in the second row of this 1939 photograph of P.S. 99 School Aides? It's from a newly added slideshow. 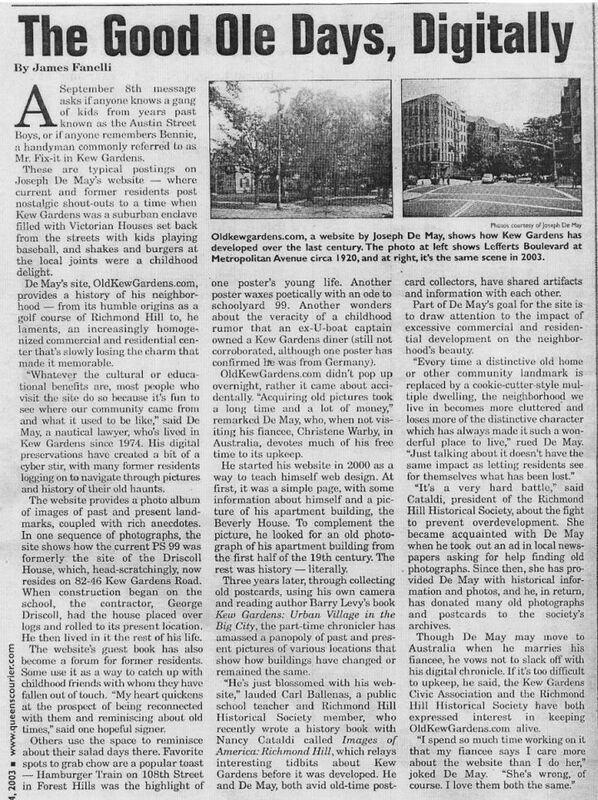 Editor's Note: There used to be a place called Art Leonard's Rainbow Inn on 83rd Avenue off Lefferts Boulevard. I assume that after all this time, Art has passed on. Does anyone know how I can contact his family? I dreamed I was many miles away from where I am now. Tucked behind the shelter of the Venetian blinds looking out towards the LIRR tracks, I felt a blanket of warmth covering me. I shook off the thought that this might be a childhood revisited, but there seemed to be no denying it. There was little snow on the ground, but the wind was chilly and it was icy cold. A figure appeared out of nowhere just to remind me that no matter where our roots lie, that we will not succeed in escaping them - not now, not ever. I was supposed to be startled at this revelation, but I tried hard to put that piece of reasoning into the puzzle I had spread out all over the carpet. The picture came alive and told me stories of tolerance, multi-ethnic upbringing, learning to choose one's paths wisely and never, but NEVER to forget that this childhood of mine, this baby slumbering in the arms of darkness, was indeed me. I was asked to wake up at this point, but chose to press the snooze button on the alarm clock and let this final piece of joy pass through me instead. It served me well during the day. >From a few thousand miles away, here in the Northeastern corner of Switzerland, I want to wish you, Joe, and all of you, regardless of creed, age, gender, faith or outlook, a peaceful and wonderful Yuletide season. May each and every one of you that has contributed anything here sleep well in knowing that, somewhere in a secluded corner of the bedroom, that same guardian angel awaits you - and may the sandman dry all tears. Here's to looking at you in 2005, love to all of you out there who in any way were or still are connected to the community in which I was raised. I'm proud of every single second I can claim to be Kew Gardens through and through. What wonderful memories this site brings back. I lived in an apartment at 8344 Lefferts Boulevard (was that the Buckingham) just down the road from Razler's candy store. MY father bought his first car after the war from Mr. Razler. Spent most of my playtime either in front of Razler's or else we would go to Forest Park. When I started school at PS 99 my mother arranged for an "older' girl Myra Lou Shansinger to walk me their. Myra Lou had an older brother Stuart does anybody remember either of them. What a walk down memory lane! I have also learned a lot about Kew Gardens that I never knew. It would be nice to hear from old classmates. This is a photo taken in Forest Park, Kew Gardens in the spring of 1954. This was a gathering place for the eighth graders at P.S.99. In the photo are left to right top row: Rosalyn Israel, Dale Silberman, Wendy Kanntrowitz, and Anne Parnas. Bottom row: Suzanne Ackerman, Patrick Edwards, David Milder and Marjorie Reimer. Editor's Note: Thanks again to Al Linsky for additional information about the Long Island Railroad eastbound waiting room shown to the left. I have added Al's comments to the sidebar at left. I lived on Austin Street just off 80th Road from 1955 to 1964. I now live in Ohio. I attended PS 99 from fall, 1955- Jan,1960 when I transferred to Kew Forest School at Austin Street and Union Turnpike. My parents and maternal grandparents are buried in Maple Grove Cemetery right next to PS 99 at the end of Lefferts Boulevard. I played often in Forest Park, and was there walking my dog at lunch when JFK was shot in Dallas, Nov., 1963. I have fond memories of growing up in Kew Gardens and went back for a brief visit in Oct, 2003, when I had business to attend to in New Jersey. It was somewhat different from what I remembered but much was nostalgic and similar. Muito bom este site, sempre que tenho um tempinho entro e confiro todas as novidades. Gostaria de agraecer por toda ajuda que me foi dada, pois sempre contei com vcs para as minhas pesquisas. Gostaria de falar tambem que sou uma fã muito grande de vcs. Um beijão e fiquem com Deus. Editor's Note: My free translation of the foregoing message is: "This is a very good site, and one that I always visit when I have time, to check out all the new features. It would like to say thanks for all the help it has given me since I have counted on you for my research. I would like to say that I am a very great fan of yours. A kiss and may God be with you. Just wanted to wish everyone a Healthy and Happy Channuka. To all of my Christian friends, I wish the joy of the season and a prayer for happiness. I want to wish ALL here who celebrate, a Happy, Healthy and Peaceful Chanukkah. Lived in Kew Gardens: In Silver Towers from 1970-1975 and then Courthouse Plaza from 1975-1977. What else could be said about A Walk Through Queens? Spend 5 minutes watching a Korean girl recite a poem about some "white boys", ten minutes on Louis Armstrong's wallpaper (and I love him), another ten minutes on Noguchi? Thirty seconds of that could not have been the Carnegie Library, Republican club, Church of the Resurrection or our movie theater marquee? We wuz robbed!!! Kevin Wolfe was dignified and did a fabulous job. His words were great in the few minutes he got. This evening, I saw the program "A Walk Through Queens", hosted by Barry lewis and David Hartman. I am proud of my borough, in which I have lived since 1959, and as much as I enjoyed the program, I wish more had been said and shown of Kew Gardens. I have lived here since 1959 amd know how special and fascinating this area is. If there were time limitations that prevented showing our community, I look forward to a future program that shows our community to a greater extent. Editor's Note: The email address this signer submitted is invalid, so I have omitted it. Editor's Note: For the latest developments in the downzoning of Kew Gardens and Richmond Hill, click here. The link will open in a new window. Close out the window to return here. But part of me will always remain in Kew Gardens! What a great site this is... It just keeps getting better and better. By the way, does anyone here have fond memories of Jahn's Ice Cream Parlor in Richmond Hill? How great was THAT place? Remember they had a "monkey" hanging over the ice cream fountain with a banana in his hand? By the way, does anyone remember a small soda fountain that was at the western end of Talbot Street? I sure would love to hear from any of my old Kew Gardens friends. Editor's Note: Kew Gardens most famous resident, Barry Lewis, teams up with David Hartman for "A Walk Through Queens" on PBS Channel 13 in New York on Monday evening, December 6th at 8:00 PM. To read an article about the show in the current issue of THE QUEENS CHRONICLE, click here. The link will open in a new window. Close out the window to return here. My Grandfather was a dermatologist with his office on Talbot Street. His name was George Klein. I am curious if anyone was a patient of his or knew him. He passed away in 1985.